Holmes Beach building official Jim McGuinness and developer Shawn Kaleta struck an agreement to mitigate a land clearing after the city lifted a stop work order on three beachfront lots. City commissioners and others, however, are still speaking out against the developer. The clearing took place in early September without notice to the city building department. Heavy equipment piled sand and pulled down Australian pines, seagrape trees and other vegetation at city beach accesses and rights of way between 47th and 48th streets and the beach. McGuiness issued stop work orders for three properties and the controversy grew among commissioners and residents. Since the clearing, developer attorney Louis Najmy of Najmy Thompson has defended Kaleta, saying the clearing came at the request of the Holmes Beach Police Department and complied with state and local laws. “The clearing of the right of way was not done as a result of Kaleta’s direction,” Najmy added. Yet, stopped by a red tag, Kaleta offered to restore the beachfront in an Oct. 4 email to McGuinness and, 51 minutes later, the building official agreed in an emailed response. As of Oct. 11, the sand had not been spread and agreed-upon restoration work hadn’t begun. The Kaleta agreement involves planting sea oats plantings landward and abutting the seawall, every 18 inches on “individually owned property” at 47th and 48th streets. Also promised for the rights of way at 101 47th St. and 101-102 48th St. are seagrape plantings — 15 feet apart at 101 47th and 102 48th, with beach daisies and railroad vines added for a natural look. 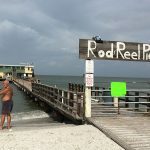 The agreement to lift the stop work order remediates coastal control line issues but not the scraping of natural vegetation from city-owned unimproved Fourth Avenue and the beach accesses, according to Holmes Beach Commission Chair Judy Titsworth. “I’m OK with what Jim did, but he hasn’t addressed what happened on Fourth Avenue and at the beach accesses,” Titsworth said Oct. 5. She blamed the beach clearing on Kaleta at Sept. 13 and Oct. 9 commission meetings. 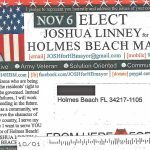 Commissioners and residents Oct. 9 asked city attorney Patricia Petruff and Holmes Beach Police Detective Sgt. Brian Hall legal questions about the clearing. “How do you deal with a person who desecrated public property? Titsworth asked. 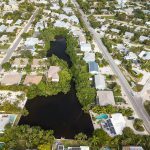 That question led to a discussion about an unrelated 2015 seagrape cutting at the 43rd Street city-owned Gulf beach access when the DEP and the city prosecuted a property owner and landscaper who cut 20-foot seagrape trees to half their height for a better view from the owner’s property at 4301 Second Avenue, across the street. HBPD charged trespassing and the action ended with a $6,000 fine and a DEP consent order requiring the owner to restore the beach access under an arborist’s plan. Commissioner Carol Soustek warned the city must be on sure legal footing. Hall told commissioners misdemeanor criminal mischief or trespass charges for the clearing are possible, but that a “dollar amount” needs to be determined. He also mentioned the state not wanting to prosecuting a case involving plants “because they grow back,” unless a monetary value can be established. Titsworth said damage calculations were underway and asked for a letter to be sent to the Florida Department of Business and Professional Regulation, which oversees contractor’s licenses. 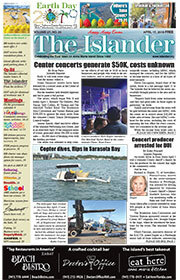 Kaleta has been the subject of prior Holmes Beach reports to the DBPA, according to Titsworth. Hurst and Titsworth pleaded the developer not be let off the hook. “What happened on 77th was an abomination. I watched it happen,” said Don Anthony, a former resident on 77th Street, who now lives in Bradenton. Petruff said she would work with the mayor to draft a letter to the licensing board. Titsworth also suggested creating a board to deal with contractors like Manatee County’s construction control board, which can take away contractor licenses. “If they can do it, why can’t we do it?” she said, adding she would put the idea on a future agenda. Meanwhile, a resident of 103 47th St. registered her sentiments in a letter. “The view from our home is an ugly flat piece of land with not even a blade of grass,” Jessica Cooper wrote in a Sept. 26 letter to commissioners. “What a mean-spirited thing to just go and level everything, some of which wasn’t even your own property, knowing there really wasn’t much anyone could do once the deed was done,” Cooper wrote about the developer who lives at 48th Street and the beach. “I feel like we are being punished for following the law and our neighbor gets to do whatever he wants,” she added. The DEP permit issued to Kaleta allowed for spreading no more than 200 cubic yards of sand landward of a seawall. No permit was needed to cut Australian pines on the properties. As an agent for three properties, Kaleta obtained Florida Department of Environmental Protection permits Sept. 10 to spread sand. The DEP inspected one site Sept. 19 and found it in compliance with state environmental rules. “No additional complaints have been received,” DEP spokeswoman Shannon Herbon said in an Oct. 12 email. “The work at the property has been and always was in compliance, and to some degree at the request of and for the benefit of the city police and emergency force,” Najmy said. “Let me be clear, my client didn’t clear the city right of way. That was ordered by the police directly with the tree clearing company,” Najmy said, adding no sea grapes were removed or trimmed. Kaleta and his wife Jennifer own 102 48th St., one of the properties identified in the DEP permit. Two other properties permitted by the DEP for sand spreading are 101 48th St., owned in a trust for Lawrence Peter Repar of Tampa and 4700 Fourth Ave., owned by Fourty Seven Street LLC. Four days before the DEP permit was issued, McGuinness issued stop work orders for 101 and 102 48th, as well as 102 47th St., for landscaping, excavation, fill and destruction of coastal buffers without city authorization. While Titsworth considers Kaleta a “repeat offender” in at least two coastal clearings — without coming to the city for letters of no-objection before clearings — Kaleta’s attorney claims the developer has been unfairly treated for a second time, referring to the 77th Street clearing, where the developer was issued a stop work order for working beyond a permit, later to be absolved by the DEP. “So, once again my client was wrongly red tagged because the city is controlled by the minority who act to stifle development in a manner that is repugnant to our U.S. and state constitutional protections,” Najmy said in his text.